This is one of those delicious stories that takes on life from many perspectives. It is my favorite type of project, appealing from many angles. It began last fall when a birthday put me on the backside of my 50s, and I acknowledged the need for a more personal focus on fitness. With no alarming medical issues beyond bad knees and the general aches and pains of middle age, I knew it was time to incorporate a more formal program of staying in shape into daily life. Running is no longer an option for me, and walking doesn&apos;t seem to be enough. I&apos;ve never had the bug for bicycling, and while I&apos;ve kayaked since the &apos;70s in the Pacific Northwest, it works only the upper body and, at my level, is hardly aerobic. Over lunch, my friend Pete Trogdon suggested I get into sliding seat rowing. Pete began rowing in college and still enjoys the sport. Today Pete&apos;s rowing boat is a Chesapeake Light Craft wherry he built from a kit a few years back. When Pete explained the many benefits of the low-impact, total muscle group workout one experiences in recreational rowing, the light came on for me. While building a Chesapeake Light Craft kit boat is immensely appealing to me, I just don&apos;t have the space or time for a project like that right now...maybe in a few years. So I contacted Bill Larson of Little River Marine, and we discussed the purchase of a fiberglass rowing skiff that would be perhaps a better (and drier) choice for me than a narrow rowing shell. The company&apos;s Heritage rowing skiffs come in three sizes, but Larson suggested the 18-foot skiff as being the most versatile for what I intended. As I researched the sport, I learned that sliding seat rowing burns more than twice the calories as running at a recreational pace, and both Pete and Bill were keen on the low-impact nature of its movements. When I mentioned my experience with kayaks, Larson commented that you won&apos;t find a kayak machine in the gym, but a rowing machine is one of the best exercise machines found in a quality gym. So I bought a slot in the production schedule for a new Heritage 18 and made plans to stop at Little River Marine&apos;s shop in Gainesville, Florida, on my next road trip south, to get the boat and bring it home. But now the plot thickens. Over the last couple of years, we&apos;ve been talking with the folks at Awlgrip about how to best tell their story of custom colors. Awlgrip has long offered custom colors to its customers, and these days it is not much more expensive than a color selected off the standard color chart. Awlgrip&apos;s hugely experienced lab technicians can match almost any color on the planet in Awlgrip. It is fascinating, yet not well known to the general boating public. Perhaps one reason for this is the fact that Awlgrip is a coating system that requires the talents and expertise of professionals, trained craftsmen who blend technical experience with artistic flair. It is beyond the abilities of the do-it-yourself boat owner. The meticulous steps of an Awlgrip paint job, from initial preparation to paint application and curing, are precisely the same on every boat, whether sail or power, old or new. And, unfortunately from an editorial standpoint, such a project takes time on boats as large as trawlers. So I saw this as a real opportunity: to Awlgrip the rowing skiff in a custom color. 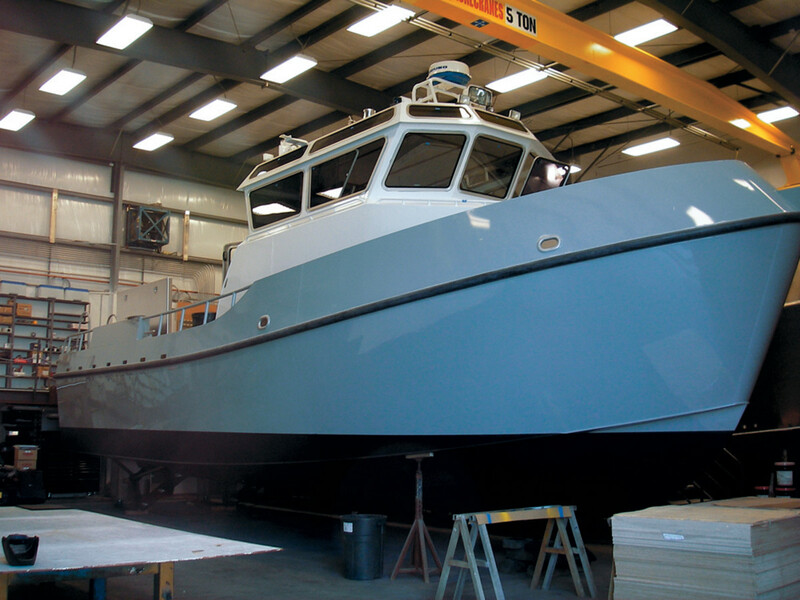 The specific steps of the process would be the same as when painting a Grand Banks 49, and the smaller size of the 18-footer would be more manageable to document, making it easier for readers to visualize the complete procedure. So I made a couple of calls, and all saw this as a story line that really rocked. We would cover a complete, professionally applied Awlgrip job, go behind the scenes of creating a custom color, and explore the joys of sliding seat rowing--all in one project. Perfect! It was decided that our technical editor, Steve D&apos;Antonio, would oversee the prep work and painting of the skiff, and document the Awlgrip job with an article. So I booked tickets to Waukegan, Illinois, home of Awlgrip&apos;s color lab, to learn all about Awlgrip, while Bill Larson&apos;s crew built the new boat. On the shores of Lake Michigan is a manufacturing facility of the Marine and Protective Business Unit of International Paint. It is a division of Akzo Nobel, the world&apos;s largest coating supplier, and home for Awlgrip North America. Netherlands-based Akzo Nobel is the third corporate owner of Awlgrip since it was started in 1973, and the global company&apos;s brands also include Sikkens and Interlux, as well as others. It is a world leader in coatings, with almost 62,000 employees in 80 countries. David Halcomb is vice president and general manager of Awlgrip North America, and was kind enough to give me a tour of the Awlgrip facility and introduce me to the key people who are responsible for the custom color business. He is extremely proud of the Awlgrip product line and said the 30-year-old paint formula remains one of the most durable, highest quality coatings in the yacht industry. David fondly recalls the time in the mid-&apos;70s when the company knew it had a success on its hands--when the word "Awlgrip" went from noun to verb, as in, "This boat was recently Awlgripped." The standard Awlgrip color card has some 60 colors, including several metallic colors. The card changes (or evolves) about every four years, depending on what people are buying. Often, colors are brought out of retirement as trends change. For many years, custom Awlgrip colors were almost all "private" colors, named for specific boats or builders, and strict rules applied about not sharing or reproducing them for other customers. That practice is no longer followed, however, and the company tries not to name colors after boats or boat companies for that reason. I heard the histories of several custom paint colors, such as "Fighting Lady Yellow," named for a race horse stable. Of course, we all know "Stars & Stripes" from the America&apos;s Cup. Halcomb has been with Awlgrip for decades but isn&apos;t ready to leave any time soon. "My goal in the next 10 years is to give the industry what it needs to carry it for the next 30 years, taking into account changing government regulations," he says. David introduced me to Beth Behrhorst, who is the front line in the custom color process at Awlgrip. She is responsible for the database of custom colors, and she informed me that Laurene Green&apos;s database number is H4232, joining more than 4,100 color choices and a list that continues to grow each month. Talk about custom colors! Would you believe there are 812 unique Awlgrip greens (with an additional 194 in Awlcraft, the equivalent acrylic product), 1,226 Awlgrip blues (with 424 in Awlcraft), and 795 Awlgrip whites (and 327 in Awlcraft)? That is simply amazing. Yellows and reds and tans and whatever the imagination can come up with. So far, the Awlgrip color wizards have been unable to match fluorescent colors, but they have not given up. Beth receives requests for custom colors from 40/50 distributors worldwide, responding to boatyard inquiries. Beth explained that the lab needs but a 2-inch square of the requested color sample to match it in Awlgrip. And the requests come in many forms, some as unique as the color. She has had to match the color of a specific red wine, a Beanie Baby, a sports team ball cap, globs of old paint in the bottom of a can, even cloth. Another suggestion is to go to a beauty store, buy nail polish in different colors, and try to mix it to the color you want. There are many ways to get a sample together, and Beth stressed that one only needs to think creatively to get it. She did warn not to use those PMS (Pantone Matching System) color wheels, as they vary from company to company and change every year. They are approximate at best, so she won&apos;t go with a PMS number; instead, she requires a sample of the requested color. She also mentioned that if you ever see a boat in a color you like and can find out where it was painted, it is likely an Awlgrip or Interlux product, and therefore can be matched with no trouble. Frank showed me some paint samples he had matched by using a color reader (called a spectrophotometer), which provides exacting specifications of the sample. Frank then puts his creations under three different light sources, widely varied, to see if they are consistent in all light ranges. Inside the light booth were four seemingly identical orange squares matched to the orange chip he was working toward. In one light they seemed the same, but switching to another light temperature made one turn almost muddy, the other slightly blue. It was really interesting, and I could easily see the challenge of getting it right. "Remember," Frank told me, "color is nothing different than the light reflecting back off it." And simply matching the paint is only one step in the process, he was quick to point out. "Ninety percent of a great Awlgrip job is preparation. The top coat is nothing without all the right steps to get the base the top coat is put on." Bob Waldon, another of the lab specialists, added that they can&apos;t match every color. Some samples they receive are composed of three different colors, which is impossible to recreate with one coat of paint. The color lab matches between 80 and 100 color samples a month, mostly in the aerospace markets, as well as for yachts. The variations of paint themes on commercial aircraft are vast, and photos around the lab of the dozens of airlines attest to the variety of colors, images, and graphics. It is a big business, and the coating requirements for commercial aviation are much more demanding than those for pleasure boating. "Correct color-matching and reproducing it precisely is chemistry and math...and a good eye for color," Frank told me. And Bob summed up the lab&apos;s mission statement with a question he would pose to a customer. "What&apos;s your interpretation of that color? Let&apos;s work toward that." When I asked one of these color gurus his favorite color, he smiled. "I don&apos;t have a favorite color, but I don&apos;t like working with green very much." A big step forward in the last few years is the company&apos;s AwlMix Color Management System. It is brilliant. Once a custom color is created in Waukegan, the precise specifications of that color become a formula of chemicals, available to the distributors around the world. Working from a base inventory of basic paints, a distributor can recreate any custom color from the data sent from Waukegan. There is no need to inventory custom paints, ship expensive product around the world, or create a monster of inventory and distribution management. 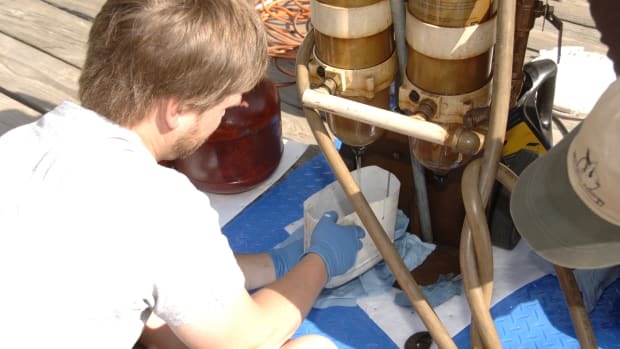 The AwlMix system is the key that allows custom colors to be not much more expensive than a standard color, and the prep work at the boatyard is the same regardless. For our project, the company that mixed Laurene Green was Fawcett Boat Supplies, the Awlgrip distributor right here in Annapolis. Amazingly, the entire turnaround of a new color occurs within 72 hours. It is a skill and expertise one senses while walking through the labs and various workshops at Awlgrip. It is a very impressive facility, with 120 people working in the aerospace and yacht coatings business. There are many reasons to paint a boat. Gelcoat fades over time. Paint wears off. Sometimes you just want a change. Color is a celebration of our lifestyle&apos;s many faces, and painting a boat in your own personal favorite color is also an expression of yourself. It&apos;s that simple. The project is done now, and the green Heritage 18 is in the water and looking pretty. Thanks to everyone who took part in this project, and thanks to Bill Larson and his crew at Little River Marine for building such a nice boat. Now, as I learn the intricacies of proper rowing technique, I am happy that I have added a routine to my daily life that is all about taking charge while enjoying the spiritual renewal that comes from being on the water. 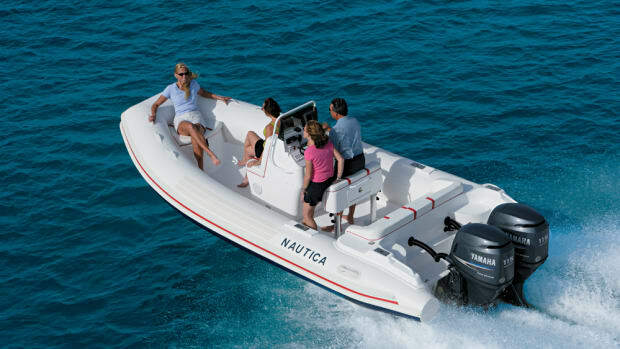 White boats, look out--your days are numbered. Go on. Express yourself in color.